Killer Characters: I could use your help here! I could use your help here! Submitted by Jordan Kelly Bingham from Victoria Abbott's book collector mysteries. Okay, Thanksgiving’s over and was it an exciting time here in Harrison Falls, New York. But now that the danger has passed, we can turn our attention to getting ahead of the Christmas rush. Well, at least I can make my list. I don’t think any of my family and friends have ever had a list. But let’s not dwell. Never mind: I like to get my gifts organized early, so I’m starting to think about that. The people I love are hard to buy for, so please send suggestions and comments if you have any. Uncle Kev will probably need bail money at some point, if history is our guide. There are no gift cards for that. But to be optimistic, maybe I should get him what? A new balaclava? Too practical? Signora Panetone is easy: food. The ingredient kind. Something that’s not easily found in Harrison Fall, New York. Dried porcini mushrooms? Maybe I should think bigger. What about a small trolley, so she can carry those heavy platters? What about a cookbook for Uncle Mick? I wonder if there’s a Kraft Mac and Cheese full color cookbook? Then, maybe a cloak of invisibility for Uncle Lucky. For my friend, Lance, the world’s sexiest librarian, something for the hipster in him. A new Trilby? An unpronounceable organic wine? Walter the Pug is easy. Tasty dog treats and a new sweater. I think catnip mice for Good Cat and Bad Cat. Jeweled collars are lovely, but it's not worth the risk of putting them on. These are the easier choices, but then there's Officer Tyler Dekker, my friend and possibly more, although we haven’t moved to the next stage. How about some suggestions, friends? You’re a bit too quiet. As for me, I already have my gift and it’s the way that The Wolfe Widow turned out. I thought I was a goner and I wasn’t the only one. I don’t need another thing. On the other hand, if my uncles could just get over the idea that the man in my life is a police officer, that would be a great gift too. Speaking of gifts, I'll have a giveaway for you here on December 30th! Save room on your bookshelf and think lucky thoughts. 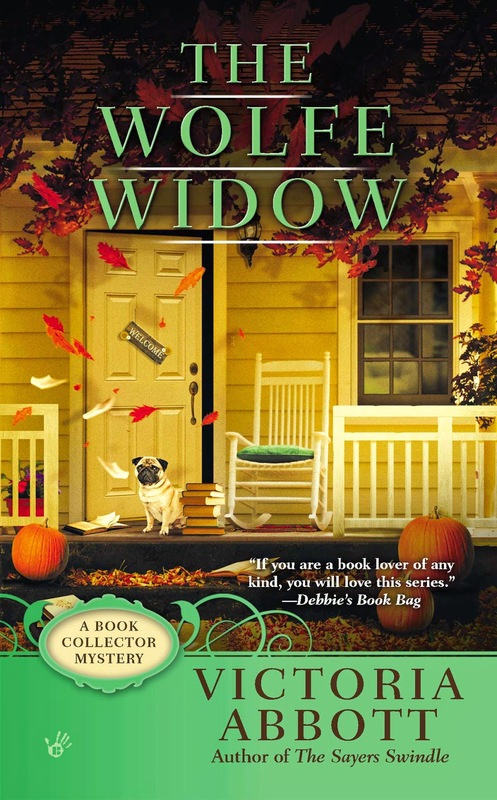 The Wolfe Widow is the third book collector mystery from Victoria Abbott. ORDER IT HERE! My family is also hard to buy for....thank goodness for Amazon.com. My daughters and son in laws post their list and I pick from them. Looking forward to reading this book and to your book giveaway in late December. Thanks for coming by, Dianne B! I love your list approach! So civilized. Just guessing here--Signora Panetone would not use the trolley the way you intended. There. Am I helpful or what? Thanks for the plot idea, Willow. Can you put a bail bondsman on retainer? Good thinking, Libby Dodd! You can help with all my lists! I have no ideas for you as i am gift-giving challenged. Money is the way these days. Scarves and hats? A bottle of wine? Or two or three. Money is often the way with us too! As for the wine, I am tempted to keep it myself. I just finished Wolfe and loved it. Kev would love a new toy for the garden. Signora would love a full table with everyone eating and enjoying her food, members of the clean plate club. I think Mick would like a dog of his own. Have a Happy Holiday. For me I am just waiting patiently for the new one.